One Pan Southwest Chicken and Rice! Even the rice is cooked in the same pan with the chicken! Made with fresh and whole ingredients, this will quickly become your favorite weeknight meal! This one pot meal is fast, fresh and super easy to make! Crunchy fresh veggies, rice and chicken cooked up in the same pot, with all the Tex-Mex Southwest flavors that I love! Oh, did I mention healthy? You can add that to the growing list of reasons why you should whip up this 30 minute meal! We are on day three of eating our way through this big old pot of yum, and I’ll be sorry to see it go. Super flavorful and fresh tasting. I still have rice left over, it will be going into the freezer for Taco Tuesday! 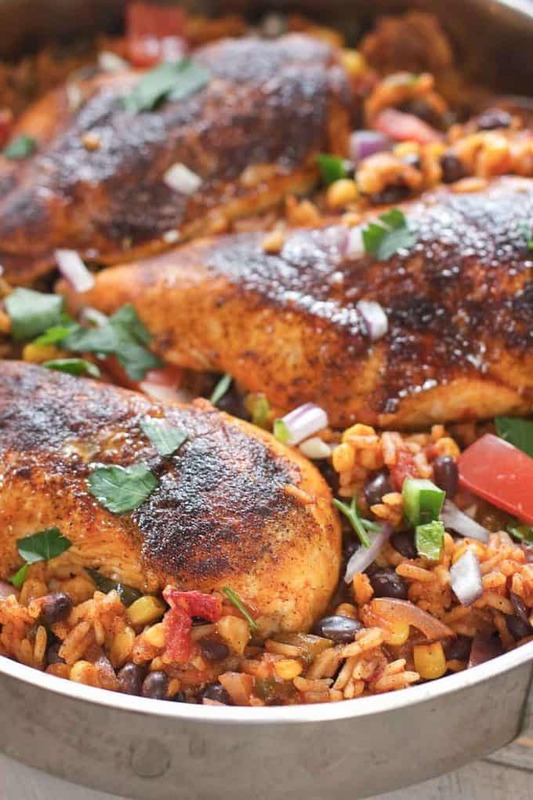 Hot to make One Pot Southwest Chicken and Rice! 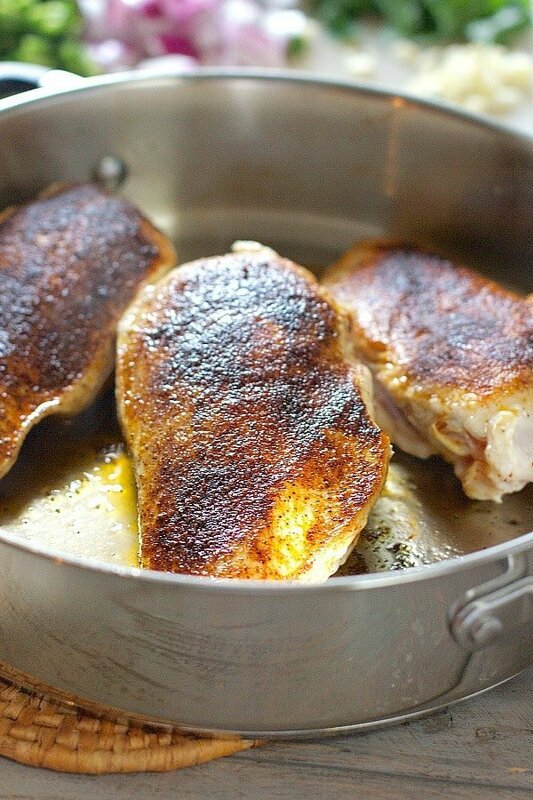 Simply sear up your chicken that you sprinkled with a mixture of chili powder, cumin and a few other pantry staples. Add a pinch of cayenne if you like it spicy. After a quick sear, set your chicken aside. In the same pan, sauté up your peppers, (I used poblano but bell peppers would work just fine), onion, corn and black beans. Add your uncooked rice, broth and enchilada sauce. (no enchilada sauce? See my sub list below). Nestle your seared cooked chicken onto the rice and cook for 20-25 minutes. You got dinner and probably a lunch or two! 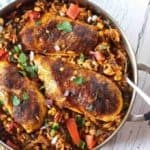 Sub chicken pieces instead of whole chicken breasts to make more of a chicken and rice tex-mex goulash. 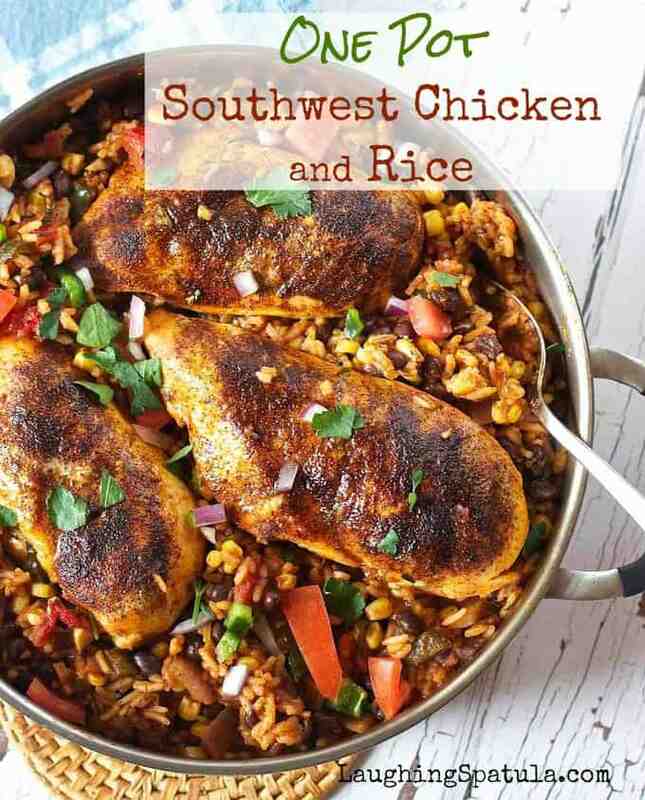 See my Southwest Chicken and Rice Skillet. No corn or black beans? How about some carrots, celery or peas. No enchilada sauce? Just increase your broth to two cups and go a little heavier with the chili powder and cumin to make up for the spice in the enchilada sauce. Quinoa can be subbed for the rice without changing the recipe at all. It has the same cooking time as white rice. Those are just a few ideas. 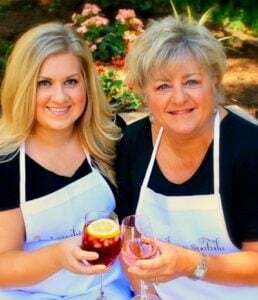 This is a very forgiving recipe! You can see all my Super Easy One Pot Recipes HERE! One of my favorites is this One Pot Meatball and Pasta Skillet...who doesn’t love meatballs!! To One Pot Easy Meals! Easy One Pot meal that is bursting with fresh veggies! Makes a big old pot for a couple dinners and maybe a lunch or two! In small bowl combine chili powder, cumin, garlic powder and 1/2 teaspoon salt. Sprinkle chicken breasts with half of mixture. Reserving half of spice mixture for rice. Heat large skillet over medium high heat. Add olive oil until hot and just beginning to smoke. Sear chicken breasts on each side for about 3-4 minutes. They will not be cooked through but will continue to cook with rice mixture. Remove from pan and set aside. In same hot skillet add onion, pepper and garlic. Saute for 2-3 minutes until just tender. Add black beans, corn, tomatoes, uncooked rice, enchilada sauce, remainder of spice blend and chicken stock. Bring to a simmer and stir. NOTE: This is a great time to taste. More chili powder, more salt? I almost always add more cumin ! Nestle par cooked chicken breasts on top. Cover and cook 20 minutes or until chicken is cooked through and no moisture remains in the pan. (NOTE: Stir at least twice. Moving your spoon around the chicken breasts to keep rice from sticking to pan. Top with cheese if desired along with sour cream and salsa! Just made this tonight! It was delicious! I added a blob of butter to the rice to reduce some of the sticking, doused the entire thing with lime juice at the end and threw chopped cilantro over the top. Thank you for the note Rachel! I am so glad you liked it. Love the addition of butter idea! Do you know how the recipe should be tweaked for brown rice? Can I just invite myself over for dinner please! This looks absolutely scrumptious and so easy. Love it and Pinned! you can’t beat a one pot dish, love the colours and the Mexican flavours. I don’t see rice in the ingredient list. How much do I need? 1 cup! Ugh, who forgets rice in the chicken and rice…I have updated. So sorry! Red or green enchilada sauce???? This looks SO tasty! I love the color on the chicken – gorgeous! This looks and sounds sensational! The colour of the seasoning on that chicken is making my mouth water! 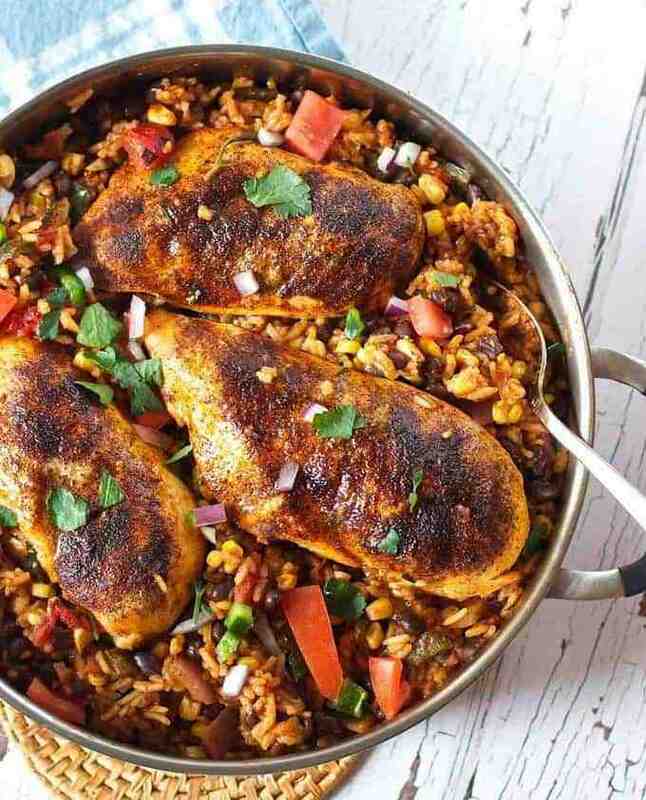 This one pot chicken dish looks so yummy and easy! I love that there is a Mexican flare to this dish! I can’t wait to make this for my husband, he’s going to love it.